April 2, 2019 by Julie Gaston . Posted in " Case Studies, Uncategorized " . 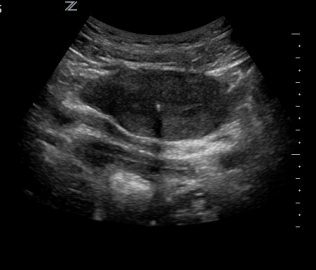 Ultrasound is an excellent tool to confirm the location of an intrauterine device. 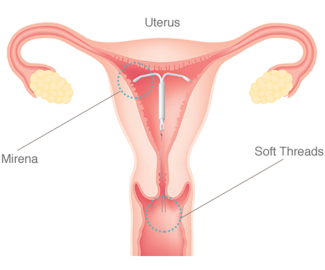 You can perform this exam after insertion to confirm placement or during the life of the IUD. 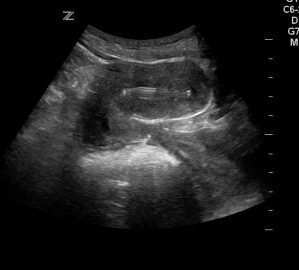 We always suggest imaging transabdominally first. 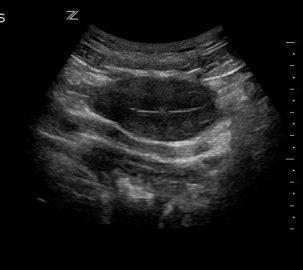 Image A is an image of an anteflexed uterus with an IUD. The bladder is empty. You can see the vaginal canal, the cervix coursing toward the transducer and the fundus of the uterus pointing toward the patient’s feet. The bright equally spaced lines in the center of the myometrium are the IUD. This appears to be in place with the tip of the device near the fundus. The next image is also transabdominal but now we are in a transverse plane. Here you only see a single echo in the center of the uterus. This is the stem of the device. This is a good sign that the IUD is in the correct position. As we sweep toward the fundus (which would require moving the transducer toward the patient’s feet) we can see the fundus. Think about that, in order the see the fundus you must move the transducer toward the patient’s feet. That is because this uterus is anteflexed, meaning it points anterior then inferior. Another reason why image orientation is so critical. If you need to, go back and re-watch the lecture on image orientation. When you reach the fundus, you should see the two arms of the device. This is a Mirana IUD. If one or more of the arms are not visible then you know the device is not placed correctly. The image looks like the Tesla logo. Now you are ready to image transvaginally. The protocol is similar, begin in a sagittal orientation, find the cervix, advance to the fundus and sweep right to left. Sweeping right and left allows you to evaluate the entire myometrium. You are looking for fibroids or other abnormalities. 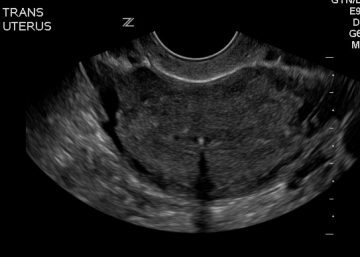 Imaging an IUD transvaginally will produce an artifact called reverberation. When there is a bright reflector the ultrasound waves reflect back and forth and produce “fake” echos below the “real” echos of the device. 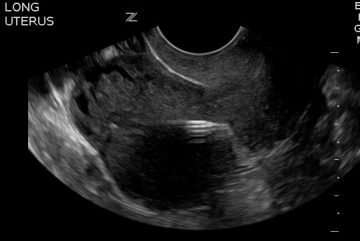 There is a loss of sound beyond the IUD so you will notice that the uterus appears blacked out. 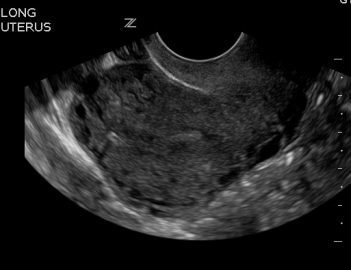 Only a true sagittal slice of the endometrial canal will give you the artifact. Here you are assessing that you see the device high enough in the fundus and that there is not a visible endometrium separate from the IUD. Next, turn transverse (thumb toward you) and sweep anterior to posterior. 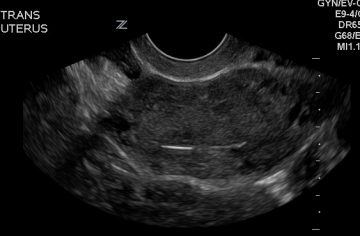 The first image you can see the IUD inside the endometrial canal. And the next image you can see the arms deployed. 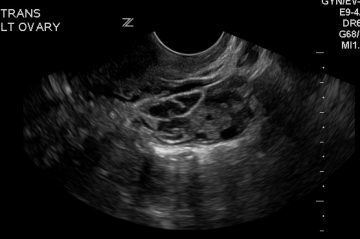 Sweeping from fundus to cervix when you are in a true coronal plane on the uterus can give you all the information you need to confirm placement. 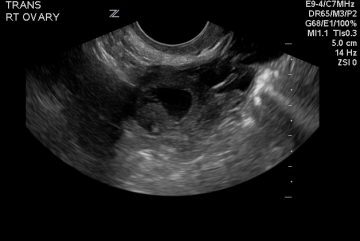 You can identify that the device is centrally located and high enough in the uterus. Don’t forget to check those ovaries! Remember, transverse plane, point toward the patients shoulder and sweep anterior to posterior. Next week we will show you a perforated IUD. Happy Scanning!